Looking to dazzle that special golfer in your life? Give the gift of golf with Troon's NEW gift card. Available in any denomination, the Troon Gift Card is flexible and offers a great value at the top clubs and courses around! Give the gift of Troon Today! Call 1.800.755.8713 for Customer Service. This Card is issued by MetaBank®, Member FDIC. After Card Plastic Valid Thru date, contact us for a no cost replacement Card. $5 fee to replace lost, stolen or damaged Card, except as prohibited by law. Does your gift card look like this? These gift cards are no longer sold, but are still redeemable at the following locations. Troon Gift Cards may be redeemed toward merchandise and golf fees. Gift Cards may be redeemed for food and beverage at select facilities. 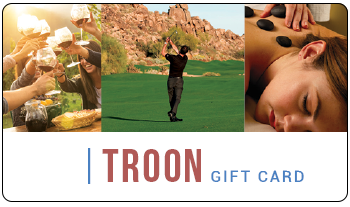 Troon Gift Cards may be redeemed at the noted participating Troon-managed facilities. Troon Gift Cards are not redeemable for cash and will not be replaced if lost, stolen or used without authorization. Except as prohibited by law, after 12 months from issue date, a $5 per month maintenance fee will be charged and applied to any remaining balance on Troon Gift Cards. This offer is not a MetaBank product nor does MetaBank endorse or sponsor this product.